I just got my copy of “The Book: New Testament” created by Swedish publisher Dag Soderberg and his company called Bible Illuminated. 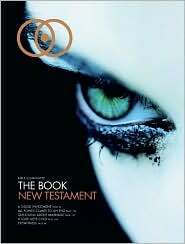 This New Testament looks and feels like a magazine you would see in any Starbucks or high-end book store. Similarities to media giants as Elle, Cosmo or GQ are easily seen in the format and layouts. The editorial pictures are absolutely stunning, but instead of articles about trend-setting in Milan or whats happening on the runaway in Paris, you get to read scripture, God’s holy word. The translation chosen was the Today’s English Version. The creator wanted a Bible that people would read on the subway or in an airplane terminal, possibly even in a university library. Rarely do you see anyone at Barnes & Noble opening up their black leather-bond, gold-foiled King James Version (King Jimmy to me) to read while sipping their latte. If you did, that person is deemed a religious fanatic looking to evangelize a passerby. Soderberg wanted a New Testament that was portable and eye-catching. He wanted people to open up the most read book of all time and not be ashamed to read it in public. Personally, I think this is brilliant. It is an attempt to bring the Gospel to the culture. Much like missionaries translating the word for an indigenous people group, we need to translate God’s word to a post-Christian, post-modern, secular American and European society. The Book is well-done, professional, and pushes the creative envelope. I love it.